Israel and Lebanon continued to exchange warnings — and shells — all day Friday. In Beirut, Hezbollah warned it will again attack Haifa, Israel's third largest city. Israel warned that it will intensify its operation in Lebanon, and CBS News correspondent Richard Roth reports the Jewish State has been doing just that. Israel has widened its offensive on Lebanon, with fighter bombers blasting the airport for a second day, residential buildings in the southern suburbs of the capital, igniting fuel storage tanks and cutting the main highway to Syria. Lebanese guerrillas retaliated for the air strikes, firing Katyusha rockets into three settlements in northern Israel early Friday. President Bush promised Lebanon's leader Friday that he would urge Israel to avoid civilian casualties and damage as it steps up attacks on its neighbor. "President Bush affirmed his readiness to put pressure on Israel to limit the damage to Lebanon as a result of the current military action, and to spare civilians and innocent people from harm," a statement from Lebanese officials said. But Mr. Bush's promise to Lebanese Prime Minister Fuad Saniora fell short of his request for pressure for a cease-fire, according to an account from Saniora's office. The White House confirmed the call, but would provide no details of the discussions. In Beirut itself, CBS News correspondent Kristin Gillespie reports many civilians are fleeing — many of them tourists from other Arab countries. The Vatican strongly condemned the military attack on Lebanon and expressed concern that it could lead to a widening of the Middle East conflict, reports CBS News correspondent Sabina Castelfranco. Pope Benedict is said to be very worried about the situation and following the latest dramatic events, which according to a Vatican statement, risk degenerating into a conflict with international repercussions. Saudi Arabia faults Hezbollah for current crisis, blaming "elements" inside Lebanon for the violence with Israel, in unusually frank language directed at guerrilla group Hezbollah and its Iranian backers. The United States will make a new $15.85 million contribution to the U.N. agency providing humanitarian relief to Palestinians, a U.S. official said Friday. The United States has provided almost $240 million in aid to Palestinians so far this year. Many Israelis were shocked Thursday when two rockets hit Haifa, the country's third largest city and 18 miles south of Lebanon. No guerrilla rocket had ever reached that far into Israel. Two Israelis have been killed and about 50 wounded by rocket fire since Wednesday. Along Israel's northern border, 220,000 people now are living in bomb shelters, reports Roth. Hundreds of Hezbollah rockets have fallen there in the last two days, and Israelis are stocking up. They don't expect it will end soon. The Israeli offensive caused political waves in Lebanon. Hezbollah was criticized by anti-Syrian politicians who accused the militant group of acting unilaterally and dragging the country into a costly confrontation with Israel. "Hezbollah is playing a dangerous game that exceeds the border of Lebanon," Druse leader Walid Jumblatt said in comments published Friday. But Jumblatt, a leading anti-Syrian figure, also denounced the Israeli attacks on Lebanon, calling them completely unjustified. "Hezbollah does have support in the Shia majority in Lebanon, but the majority of people in Lebanon don't want this. They want a normal life," Haass told Early Show co-anchor Harry Smith. Clearing away broken glass at his shop in Beirut, Fadi Haidar, 36, estimated the damage to his electrical appliances store at $10,000-$15,000. "I have huge debts and now my store is damaged. But Israel is our enemy and every Muslim must make a sacrifice," he said. He rejected criticism of Hezbollah and its leader, Sheik Hassan Nasrallah, for kidnapping the Israeli soldiers. "As time goes by, they will all realize that Sayyed Nasrallah is right and is working in the interest of Muslims," he said. A young man with blood pouring down his face and on to his bare chest was shown on Lebanese TV walking out of a damaged apartment building. 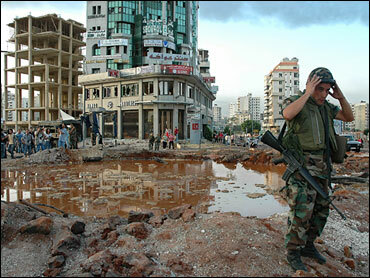 The TV showed a missile had gouged a huge crater out of the main Mar Mikhail crossroads in southern Beirut. Firemen were seen struggling to put out several fires as glass, aluminum siding and stones littered the streets. Israeli warships shelled the coastal highway north of Sidon, slowing down traffic considerably but not actually cutting the road, witnesses reported. Israeli planes also hit transmission antennas for local TV stations in the eastern Bekaa Valley, a Hezbollah stronghold. Anwar Raja of the Popular Front for the Liberation of Palestine — General Command said the planes struck the communications towers, but did not hit the guerrillas' base at Qousaya.